Dr Candler is excited to bring the Profound system to Cairns. This market-leading, innovative device is a one-off treatment that offers one third of a face lift....without the surgery or expense. We can now improve jowls, double chins, nasolabial folds and redefine the contour of the jawline and neck with one simple treatment. 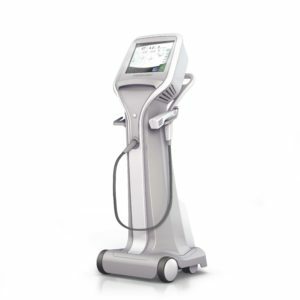 The Profound system uses radiofrequency needling technology to deliver just the right amount of heat and agitation to the skin to generate skin tightening. Skin tightening is achieved through the production of new collagen and elastin fibres. Volume is also restored as natural hyaluronic acid is generated within the skin. Elastin is a protein that coils and recoils like a spring within the elastic fibres of connective tissue in the body- like your skin. Elastin is what makes your skin, heart, lungs and many other tissues elastic so that they can snap back into shape after stretching or contracting. Elastin works together in your skin with collagen. Elastin provides elasticity and collagen (another very important protein in your skin) provides structure to keep your skin smooth and firm. Starting in our mid 20s, elastin starts to break down and become less elastic and lose its spring..this leads to skin laxity, jowls and sagging skin. Elastin is normally no longer made after puberty and as such, ageing begins. In order to build new elastin you need to cause a certain amount of damage to the skin by heaintg for example, so that the elastin starts to break down. Then a healing process begins to build new elastin fibres. Profound is a one-off treatment performed by your doctor. Local anaesthetic is used to manage comfort. The Profound system delivers energy to the deeper skin layers with exact precision to make your treatment as effective as possible. Profound has an excellent safety record. Dr Candler will answer any questions or concerns you have during your initial consultation. You will only need 1 treatment to rejuvenate your skin with Profound. We recommend having a tailored skin program which includes 1 Profound treatment along with other services like laser, skin needling, IPL and peels. The Profound treatment promotes natural production of new elastin and collagen and other components of healthy skin over time. Most patients report seeing improvement 6-8 weeks post treatment. because new elastin and collagen require time to fully develop, optimal results will not be observed for at least 3-6 months. However, there are a number of factors that will determine how long you can expect the results to last, including your health, age, and how you care for your skin after the treatment. This is why we recommend continuing to maintain your results with other treatments and products. After the treatment you can expect to return to normal activities the next day. You will have some swelling and redness that can be covered with makeup 24 hours after your treatment. Some patients will swell more than others, but this does not stop you from resuming your daily activities. Ideal candidates for Profound are people who are seeking to reduce the signs of ageing. In clinical studies, Profound treatments had over a 90% response rate for wrinkles and skin laxity. You will need a consultation with Dr Candler before you can have your Profound treatment. At this consultation you will have photos taken and all of your questions answered. Click here to book a consultation or call the clinic at 4041 5770.